Living walls have become so popular that now there is competition to build even larger and the taller vertical gardens. 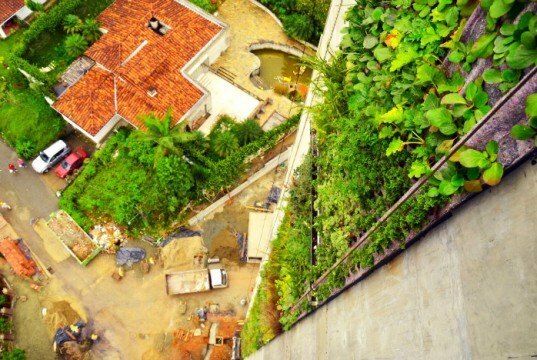 The second tallest living wall in the world is currently the Green Medellin wall by Groncol and Paisajismo Urbano. 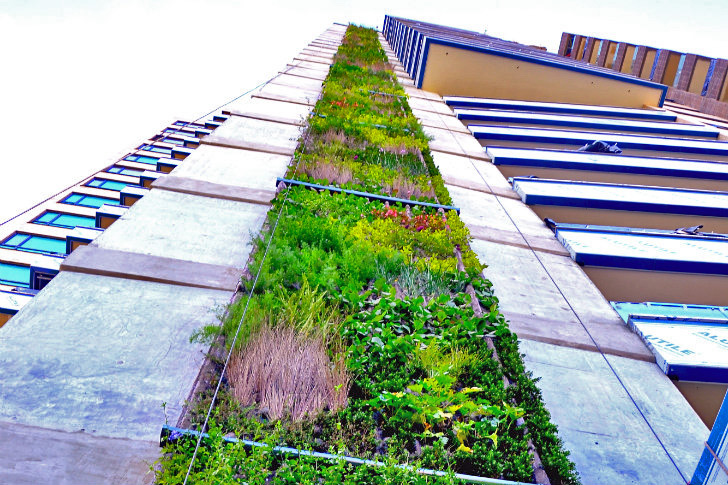 Located on the side of a residential building, the vertical garden is 300 feet tall (92 meters)! The impressive installation stretches up, up and up to the top of the building and features hundreds of native and adaptive plants that were specially selected to withstand the weather and strong winds found at that height. Groncol and Paisajismo Urbano have been working on a number of projects in Colombia recently, and they just completed the Green Medellin wall. Located on the side of a residential building in the “el Poblado” neighborhood, the green wall gives the apartment complex a unique characteristic. The wall is 300 feet (92 meters) tall, and residents will be able to view it from their balcony windows as they take in the surrounding view of the city. Groncol was responsible for the design and construction of the wall, while Paisajismo Urbano is in charge of the hydroponic technology behind the project. They coordinated to select the variety of plants, which includes native and adapted plants that can live in very tough conditions due to the wind. The installation’s 300-foot height means the plants will be buffeted quite a bit, so a carefully orchestrated plan will help them thrive in the wind while mitigating disease. Pablo Atuesta Pradilla, General Manager at Groncol, believes that the Green Medellin living wall is officially the 2nd tallest living wall currently completed. It comes in behind the vertical garden on the Antilia house in Mumbai, although Pradilla explains that it uses a different technology and technique than their hydroponic garden. A number of other super tall vertical gardens are in the works though, and this one in Colombia may soon be surpassed. Groncol and Paisajismo Urbano have been working on a number of projects in Colombia recently, and they just completed the Green Medellin wall. Located on the side of a residential building in the "el Poblado" neighborhood, the green wall gives the apartment complex a unique characteristic. The wall is 300 feet (92 meters) tall, and residents will be able to view it from their balcony windows as they take in the surrounding view of the city. Groncol was responsible for the design and construction of the wall, while Paisajismo Urbano is in charge of the hydroponic technology behind the project. They coordinated to select the variety of plants, which includes native and adapted plants that can live in very tough conditions due to the wind. The installation's 300-foot height means the plants will be buffeted quite a bit, so a carefully orchestrated plan will help them thrive in the wind while mitigating disease. Pablo Atuesta Pradilla, General Manager at Groncol, believes that the Green Medellin living wall is officially the 2nd tallest living wall currently completed. It comes in behind the vertical garden on the Antilia house in Mumbai, although Pradilla explains that it uses a different technology and technique than their hydroponic garden. A number of other super tall vertical gardens are in the works though, and this one in Colombia may soon be surpassed. Drawing showing a portion of the living wall and the planting scheme.